While some procrastinate about the deliverables of a message because of its “shocking” contents, while the same ones judge, ban, discredit, boycott too quickly branding that is not conform to their values and identities, let me relativise by giving you another perception of an ad. 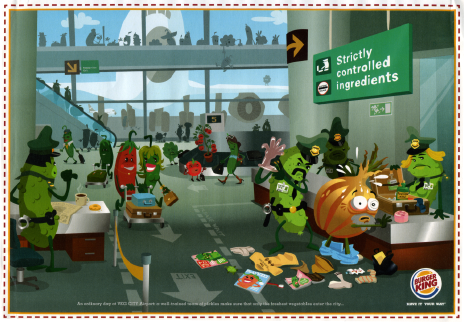 In a cartoon-like designed campaign series targeting the video-game generation, Burger King uses wittily in a versicolored palette HUMOR to accentuate its messaging “strictly controlled ingredients, fresh tomatoes, fresh ketchup, no artificial colorants added, have it your way…”! With strong references to the American culture ( Halloween, Mardi Gras in New Orleans…) and a wink to any society ( New Year’s Eve, airport security screening…) through the use of archetypes, Burger King underlines their dedication to quality and their intransigence to consumers’ satisfaction. Far from mixing apples and oranges, in the so criticized Airport plate, Burger King in a dominant green color drawing refers subtly to the green trend, and invites its guests to consume fresh vegetables! In its other controversial plate called Red Light District, the potential client is introduced to their new spicy veggie line! Where did the brand fail in its messaging? Isn’t it what we expect from our brands, honesty and quality? So enough of crucifying advertisements (one week ago Heinz was on the hot seat), enough of judgmental minorities, rather than focusing on sabotaging persuasive and creative Artwork made in Germany, concentrate on the society illnesses! To the Epicureans, let’s celebrate this visual delicacy and let’s enjoy a spicy-veggie burger!